Announcement Give the Gift of Intentionality and Remembering. Give the Gift of Intentionality and Remembering. 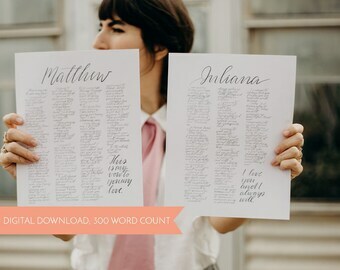 Love the vows we ordered from TheVowCollective! So beautiful! Our son and daughter-in-law were thrilled. Everything was done exactly as ordered and shipped quickly. Such a creative, memorable gift - many thanks to the artist! The cards arrived timely and perfect. I call my daughter Babycakes, so she will love these! Custom work can also be requested in Greek, specifically verses! Stacie's husband speaks and writes in Greek! Here we are! In the flesh! Clinging to one another and the vows that hang in our bedroom! 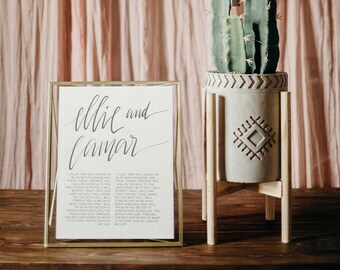 For a more modern look, I offer geometric frames and typed vows! 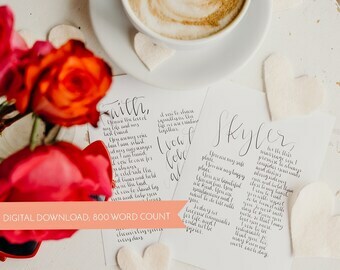 Stacie hand-letters vows, song lyrics, verses, family mission statements, and life mission statements. Weddings are a Day, Vows are a Lifetime. Hi, I'm Stacie. A lifestyle blogger, wedding photographer, vow calligrapher, and spiritual mentor to college students. My husband, Brett, is an academic scholar and professor. Together we quote Parks and Rec, sing covers of songs we love, and invade coffee shops. We currently live in a windy desert city in West Texas. 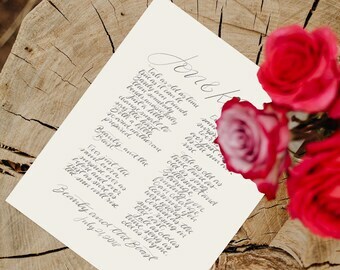 The very first set of vows I designed were my own. I had to search in our attic for a copy of our wedding sermon. I hadn't seen it since our wedding five years before! Once I reread what we vowed to each other, my heart sank a little--- how was I supposed to be keeping these vows if I'd forgotten what they were? And what has become the most important piece of art in our bedroom, is something I want everyone to have access to, because marriage vows aren't just a walk in the park and they are EVERY BIT worth remembering and keeping. It certainly is easier to live them out when we can accessibly see what they say. Three years into being married, my husband and I decided I should try to build my creative photography and design business. Here I am-- a wedding photographer and vow designer. I've been photographing weddings for three years now and designing for four. I hope to continue to do so the next 15-20 years. Stacie is the owner and designer of The Vow Collective. 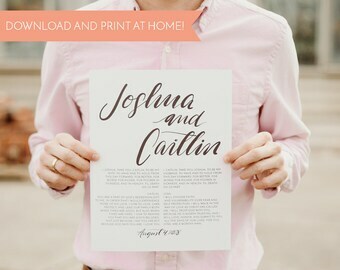 Her goal is to have her custom vows be the number one wedding and anniversary gift couples and wedding guests invest in, because weddings are a day and vows are a lifetime. 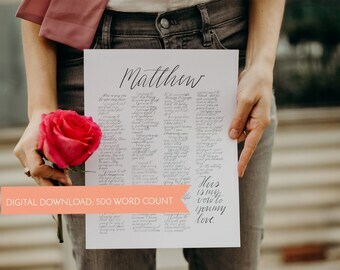 While my shop also offers custom first dance songs, wedding verses, life mission statements, and verses in Greek/English, I want you to know this all started with a desire for myself and my clients to thrive in their marriages.